Tomorrow morning I will end this blog – four days late. 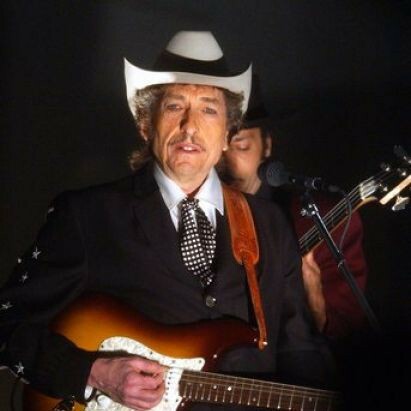 My goal was to write about one year in the career of Bob Dylan for each of the fifty-two weeks of 2014, listening only to music produced or released during that year. When I registered this domain in December 2013 with the intention of writing this blog I had enormous doubts that it would go anywhere. I almost didn’t share news of it, thinking I should write for a few weeks to see if it was even going to work out first. Instead I jumped in head first, and it all mostly worked out. This, the penultimate post, is the meta-post. I want to reflect a little bit on the blog itself before wrapping up. I’m going to start with the bad and move on to the good, because there has been a lot more good than bad, but I do want to vent a little bit. Let’s start with WordPress. This blog is run through WordPress. This started off really well. Acquiring the domain was easy, and setting up the page was simple. I downloaded the app and learned how to post. Early in the year adding videos was a real pain. You could really only add YouTube videos and it was complicated. Uploading pictures was slow. The whole thing is definitely not drag and drop, and for a middle-aged Mac user a lot of the solutions to problems were never going to happen. You’d get advice about writing scripts to fix issues and there was just no way. I did like the WordPress notification system, and it rolled out the blogs to FaceBook and Twitter well (though I did learn of complaints about the way other people saw them on FaceBook, and there seemed to be no fix for that). Midway through the year WordPress changed things up and started a new posting window. Things went downhill at that point. Formatting became unreliable. Some posts (maybe this one? – on preview, yes, this one) have no spaces between paragraphs and I have never figured out how to fix that. I’m really disappointed with how the formatting worked over the past two months and that would discourage me from using WordPress again. Also, the app became unusable for me sometime in December – it just stopped letting me log on and rather than being able to fix it I simply deleted it. I don’t think that WordPress has strong enough support for me to recommend them as a blogging tool. In the future I would try something different. They did do an excellent job blocking spam – the blog was spammed more than 15,000 times this year, and they got all but about three of them. Good job there. Apple also did me few favours. I downloaded many concert bootlegs and imported them into iTunes. It took a long time to figure out the best way of using the metadata in iTunes and I worked out a system that made things easy for me. I think Apple updated iTunes twice this year, and one of those was a major upgrade. Each update made my system work less well as Apple decided I should do things their way. I was able to twice retrain myself on iTunes, but it is not as good as it should be and it has been a frustration. Worse was Notes. I wrote every draft of every post for six months in Notes because it was easy to do so and it synced across my computers at home and work and my phone. Then a new update made me lose access to all of that – the problem is with my AppleID and Apple has never been able to fix it despite three or four long attempts with tech support. A lot of the suggestions amounted to “we could wipe this and start again” and I don’t trust Apple enough to do that. So I lost the early drafts, which isn’t a problem because they’re here on the site. But not good. I switched to EverNote and that has worked mostly well, except for one hiccup where I thought I had lost it all. I’ve gotten back into EverNote in a big way and now the only thing that irritates me is their auto-correct, which is a bully and often won’t let you correct their mis-corrections. They particularly hate the name of Dylan’s video director, Nash Edgerton. They remove the “d” every. single. time. YouTube worked mostly well, but the recent decision by them to autoplay the next song in the list is killing me. I open all the videos when I’m posting them and that autoplay feature is the worst. DailyMotion is even worse at that though. I had problems with Vimeo for most of the year, but they’re working great now. Yay Vimeo! YouTube, Vimeo and the rest, of course, are often thwarted by Columbia and Dylan and the lawyers who get things yanked. I’m fascinated by what is up on YouTube and what is not. I wish Dylan would allow more of his stuff to be up there – it would have helped me tremendously by allowing me to link to things I was writing about. I never posted anything myself on line – I only linked. That’s my take on bootlegging, I guess. The bootleggers, well, god bless them. I am grateful that I was steered right very early on in this project. They perform an invaluable public service. I believe in the code: If they release something that has been bootlegged, buy it. I bought The Basement Tapes Complete and if you’ve downloaded the bootlegs, buy the album. I do appreciate Columbia releasing The Complete Album Collection – made my life easier. A Complete Bootleg Series Collection would have helped too. 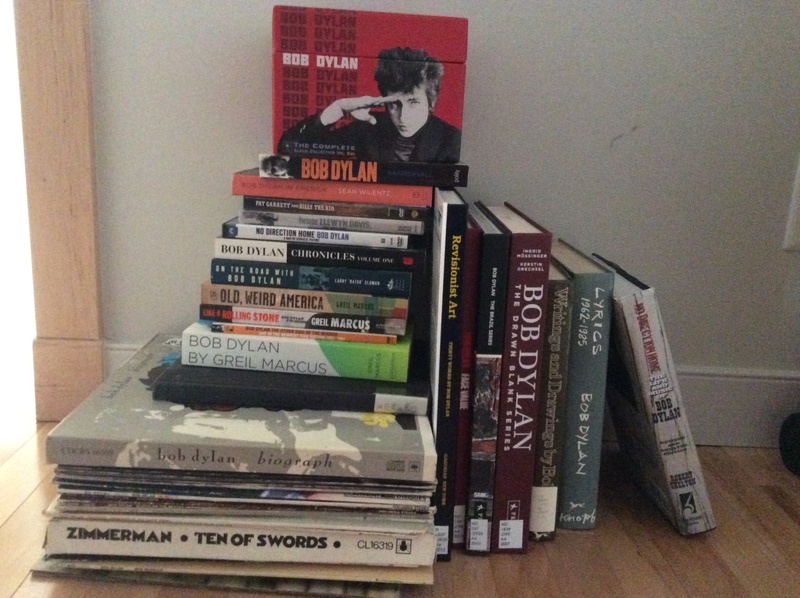 I bought more than a dozen books about Dylan this year, mostly through Amazon. Also bought about the same number of DVDs. I borrowed most of the art books from the my university library, which is fortunate because I didn’t like most of them and wouldn’t have wanted to pay for them. I could not have done this blog without the help of Olof Bjorner’s site. Not even close. What an incredible resource. Other sites – ExpectingRain and Bob’s Boots notably – were essential, but Bjorner was absolutely mission critical. This is the 359th post of the year. I had aspired to one per day. That was tricky during periods of Dylan at rest (late-1960s, for example) but was amazingly easy a lot of the time. Obviously I could have stretched out the post count by talking more about individual songs, but I’m happy with the volume of material that was out there. I’ll miss one per day by about nine posts, which is pretty good. I felt bad every day that I didn’t write something – exactly the same way I feel bad if I don’t work out. I appreciate the discipline that the blog gave to my writing – there are a lot of posts here that were gutted out when I had no desire at all to write them. Write every single day, that’s my motto. The blog settled in to a steady state of a couple hundred readers, and I am really grateful to you all for that. In the past couple of months I have had the tremendous experience of meeting people on my travels who are readers of the blog that I didn’t know were reading. At a conference in Columbus, Ohio I had multiple people come to talk to me about the blog who I didn’t know were readers – that has been extremely gratifying. In the last few days I’ve received some lovely notes from readers as well – it’s truly appreciated. I especially want to thank those of you who lefts comments. This blog really wasn’t set up in a way to reward commenting, but I did want to leave it open. I particularly appreciated notes of correction – this whole thing has been a learning project for me, so those comments were really important. WordPress tells me that Rusty was the most prolific commenter this year (65 comments) and since he was one of the people who told me that this was a good idea when I was thinking about it, I’m glad he came along for the ride (he owes me a Great White Wonder, by the way, and I’m going to Florida to pick it up). Special shout out to my friend Marc, who said “I should read your blog” to me almost every Thursday morning at hockey and who then said in November – November! – “Hey, did you know that you can have your blog emailed to you?”. D’uh. A special thanks to Heath McCoy of the Media Relations team in the Faculty of Arts at the University of Calgary who wrote a profile of this project that ran this past summer. That single story spiked the blog traffic by about a thousand per cent for a short while. It settled back into a steady state, but at a higher level than before. We tweeted that story to @BobDylan, but if he read it he never tweeted back. Alas. The most read single piece was “With Willie Nelson”, which I think was the top of the site piece the day that Heath’s story hit. The unmedia-aided best of was the Dylan appearance on David Letterman with The Plugz from 1984. That one hit my age cohort right in the sweet spot of our youths, and went mini-viral around my own social network. My wife and son put up with a lot of Dylan this year, and I’m eternally grateful for their patience on this. I’m not sure how many words I wrote – WordPress doesn’t seem to have an easy way of giving me that stat other than scrolling through every post and adding it all up which is something that I don’t want to do. I would guess more than 200,000 words in total, but that’s just a guess. As an academic, I write a lot in life but I’ve never written this much this fast and put it out there for consumption. There’s a lot of material that I would take back. Posts that didn’t gel because I didn’t have the time. Fitting in daily writing around my job and life and other interests (and other writing!) has been a challenge, but a happy one for the most part. I never felt that the blog weighed on me as a duty, and I constantly looked forward to the next thing. Every week I probably looked forward to something that was coming up. There are posts that I wish I had said more about, but time was always an issue. Writing is a lot of fun for me, and the blog was always a source of stress relief, never stress inducement. I feel like I got better as the year went on, generally. If not, I at least got faster. My last scheduled post will go up tomorrow and then I’m going dark. I’m keeping the site up for the foreseeable future, and I’m going to look into ways of archiving this as well. I may come back unannounced from time to time, as when a new album emerges next month, but nothing regularly. During the entire course of the year I only broke the “no skipping ahead, no going back” rule one time – that was driving from Cleveland to Columbus after seeing Dylan live. I felt a strong need to listen to some of the songs that I had just heard him play. For the most part, though, I held to the constraints, no matter how occasionally frustrating that has been. I’m looking forward to being free of that constraint. I had hoped to do a “Bob Dylan’s 100 Best Songs” list or some kind of summation. That’s not going to happen. That’s not tomorrow’s post. I will need a lot more time to digest this year than that would allow. Maybe I’ll come back for that in the future. People keep asking me if this is going to become a book, or a university course or something like that. It won’t be a course for the foreseeable future, and I don’t think it will ever be a book. I think it’s a blog, and that might be all that it needs to be. I’m thinking about it. Thanks for coming by – this has been a lot of fun. I’m going to go listen some Rolling Thunder bootlegs and then to some Gospel period bootlegs. But I’m not writing about it.